Where would you see this cat's eye? Where would you see this cat's eye? Correct. White cat's eyes mark the centre line of the road. 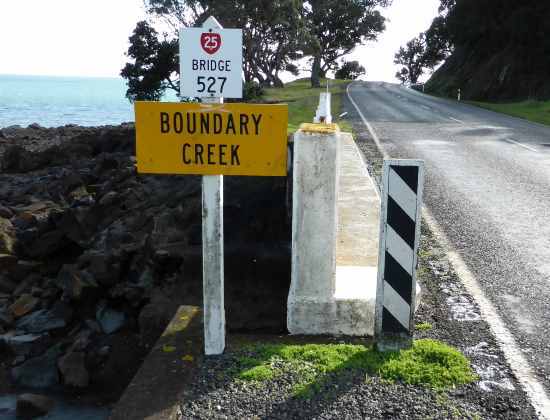 To help drivers see where a road is going ahead, both in the day and at night, roads are often installed with markers on the left and right verges, road studs (also called cat’s eyes or reflective raised pavement markers), and markers on bridge parapets. On the left of the road the Edge Marker Posts are a white post with two red strips and a white reflector, and on the right of the road you see the back of this marker which has a solid red band with a yellow reflector. You can see this in the image below of the Thames Coast Road. In the dark, there is no lighting on this road and there are plenty of corners, so the road markers help define the road’s direction ahead. The markers themselves are plastic, flexible, high-gloss white strips that are designed to be durable enough to last 10 years. Because they are flexible they present a minimal hazard if they’re hit by a vehicle. The red band is designed to be fade-resistant. The retroreflective strips in either white or yellow are applied with adhesive. The post itself is between 90-110mm and when they are inserted into the ground they are at least 800mm tall. They can be inserted into the ground, or attached via a clamp to another mount on the ground if the ground isn’t penetrable. The markers are designed to be run over at least 10 times and return to their upright position without losing the red band or the reflective material. 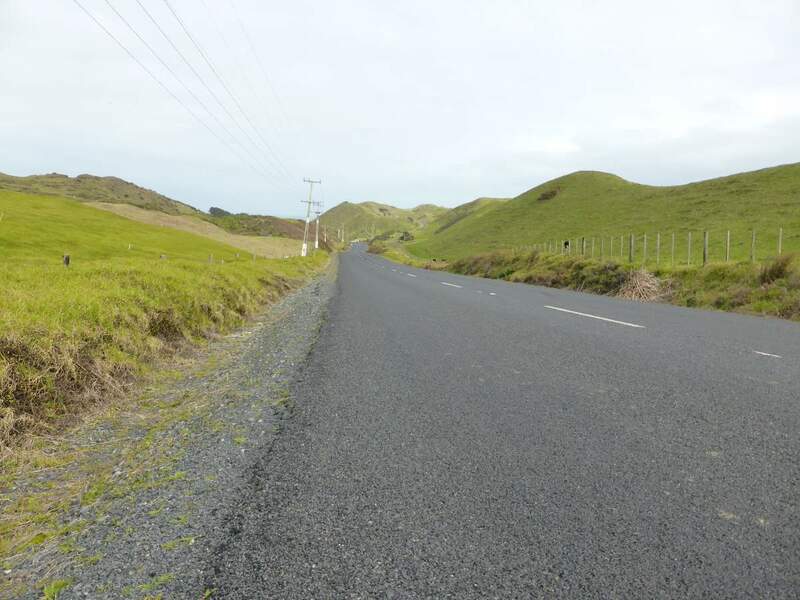 Whereas on this road, which is a secondary or minor road, there are no markers or lane markings, and gravel shoulders which make the road more dangerous, especially at night. 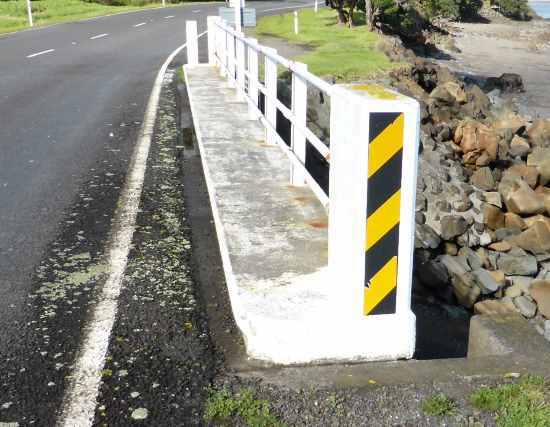 As bridge parapets (end posts) are sturdy and will cause a huge amount of damage to your vehicle if you hit one, they are marked on the left and right with highly reflective signs. They are what’s called a ‘point source of guidance’. On the left of the bridge there are black and white diagonal stripes pointing downwards towards the road. On the right of the bridge there are black and yellow diagonal stripes pointing downwards towards the road. You can also see that the ends of the bridge are painted in white to be more visible. Why do we use cat’s eyes on the road? 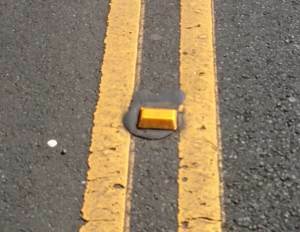 Cat’s eyes are also called road studs or retroreflective raised pavement markers (RRPMs). 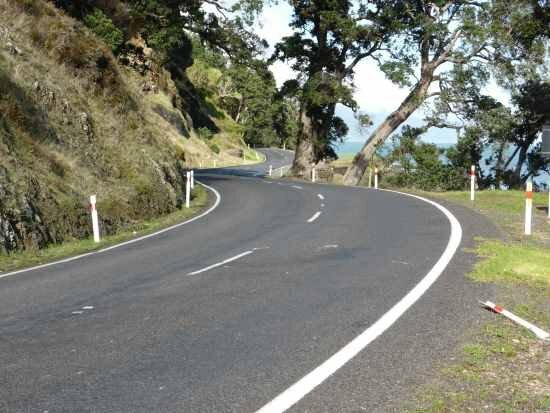 There are several types of cat’s eyes used on the roads in New Zealand and they serve three purposes. Visual lane marking – using white in the middle and red on the left edge means that road users can follow these to stay in the lane. Using yellow where there are yellow no overtaking lines add visual reinforcement to the rule. Special feature marking – fire hydrants are marked with blue road studs and, in some areas, culverts and drains are marked with green road studs. Cat’s eyes come in several different colours. Blue marks the location of a fire hydrant. Blue reflectors are installed on, or just to the left of the centreline of the roadway. They were first introduced in 2004. They are called retroreflective raised pavement markers or RRPMs. In other countries they are called road studs. While you might not notice them while you are driving around, they are useful for vehicles attending a fire because they can quickly locate a source of water. On unlit rural roads the studs are in groups of four, one metre apart, with 10m between each group. Only one of the group of four road studs is required to be reflective. On no overtaking advance warning lines they are spaced 20m apart. 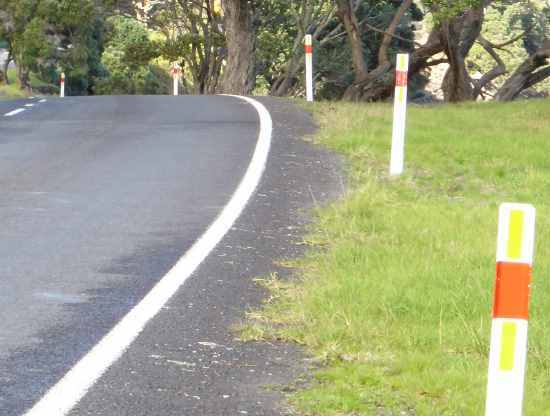 Red cat’s eyes mark the left edge of the carriageway and white cat’s eyes mark the centre line when overtaking is allowed.